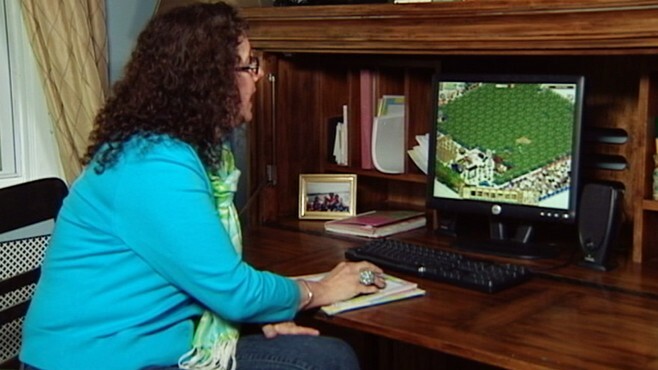 WATCH Why Are Women Obsessed With Farmville? When farming met Facebook, the result was FarmVille, the wildly popular social networking game that's being played by a whopping 80 million people each month. What's more, the majority of the game's players are 40-something women. That flies in the face of convention, which says so-called gamers tend to be younger men. In fact, since its launch in June, FarmVille has turned those norms on its ear. It started out as a game for teenagers, but today it's played by moms, dads, grandparents, younger children, retirees, professionals, and others of diverse ages and backgrounds. The game revolves around the tending of a virtual farm -- complete with crops, animals and farming equipment. For 49-year-old Maria Graziano, it is becoming an obsession. "My husband just walks past me and says 'you have got to be kidding. You are on FarmVille again?'" the mother of two told "Good Morning America." Her love affair with the game started innocently enough. Her son wanted a Facebook account, but Graziano told him he wasn't old enough. So he asked her if he could use her account to play FarmVille. "He lost interest pretty quickly, and I took over," she said. Graziano, a part-time fashion buyer from Huntington, N.Y., says she checks her farm twice a day. But her daughter, Katelyn, disputed that claim. "Definitely more than three times a day," Graziano's daughter said. "I would say, like, five. I know she will go on it first when I get home. Then she will be like, 'Katelyn, wait, can you get off for a second so I can go on?'" Graziano represents a growing demographic. The average social gamer is not the stereotyped young male, huddled in the basement, absorbed in a role-playing game. Instead, the average social gamer is now a 43-year-old woman, according to PopCap Games, a online gaming company. For some, the love of gaming has gone past obsession and verged upon addiction. According to Kimberly Young, a psychologist and Internet addiction specialist, people's preoccupation with FarmVille may signal a problem. "They tried to stop. They couldn't. They tried to put time limits on their FarmVille use, but they couldn't succeed," Young said, speaking in general about women who find it hard to kick the FarmVille habit. Young could have been describing Marianne Thomas' life. Thomas, a 34-year-old stay-at-home mother from Colbert, Ga., described herself as a former FarmVille addict. "I played in the morning, in the evenings, all during the day. I thought about my crops all the time. I gained probably about 10 pounds. I quit going to the gym, quit doing my chores, ignored my house," she said. Thomas decided that the only way should could get her life back to normal was to quit FarmVille -- cold turkey. "I vowed I could never play that game again, because I knew it took all my time and I was ignoring everything I should have been doing," she said. Quitting isn't easy, Young said. "A lot of people say 'Oh, I can quit anytime I want to,'" Young, who founded the Center for Internet Addiction Recovery, added. "But a lot of people, when they quit they feel they miss it, they are dependent on FarmVille, they just can't stop, they crave it." Created by the social gaming company Zynga, FarmVille lets players earn virtual "coins" when they harvest their crops. Players can use those coins to buy more crops, livestock or other items for their farms, such as picket fences and gazebos. Crops grow or ripen over different periods of time -- hours to days in the virtual world. The game's players have virtual neighbors, other Facebook users who also play. Neighbors can help each fertilize crops and get rid of rodents, and they can also send each other gifts. FarmVille recently added features where users can use real dollars to purchase virtual coins and FarmVille money. In fact, 15 percent of the total number of FarmVille players -- or 12 million people -- actually spend real money on the game. Five percent of players spend at least $20 a month to get "coins" to allow them to advance in the game faster than competitors who play for free. The play-to-pay option and advertising revenue are expected to make Zynga $450 million this year alone. FarmVille outsiders don't understand the fuss of building a virtual farm or gifting virtual farm gifts with others. Young said the social component of the game was part of the allure. "It connects many people that might not normally be connected. They have a common goal, they do like to show off their farms." Set an egg timer next to your computer and monitor how much time you spend playing the game. Keep a journal of all the times you are on, then review the journal periodically. You'll probably find that you visit the game more than you realize. Limit your computers to one in the family room so everyone has to share. List the consequences of your absorption with the game, such as forgetting to pick up dinner or being late for work. ABC News' Toby Phillips contributed to this story.